Water is one of our most precious resources; our lives depend on it. 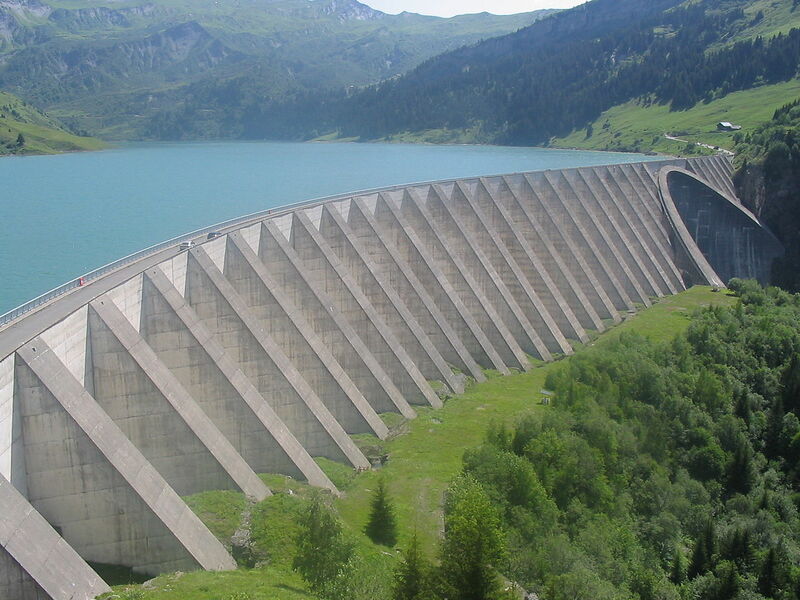 Throughout the history of humankind, people have built dams to maximize use of this vital resource. Dams provide a life-sustaining resource to people in all regions of the United States. They are an extremely important part of this nation’s infrastructure—equal in importance to bridges, roads, airports, and other major elements of the infrastructure. 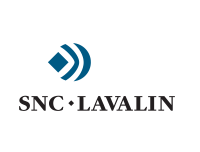 They can serve several functions at once, including water supply for domestic, agricultural, industrial, and community use; flood control; recreation; and clean, renewable energy through hydropower. As populations have grown and moved to arid or flood-prone locations, the need for dams has increased. Electrical generation: The US is one of the largest producers of hydropower in the world, second only to Canada. Dams produce 8-12 percent of the nation's power needs. Renewable, clean energy: Without hydropower, the US would have to burn an additional 121 million tons of coal, 27 million barrels of oil, and 741 billion cubic feet of natural gas combined. Flood control: Dams built with the assistance of the Natural Resources Conservation Service provide an estimated $1.7 billion in annual benefits in reduced flooding and erosion damage, recreation, water supplies, and wildlife habitat. Dams owned and operated by the Tennessee Valley Authority produce electricity and prevent an average of about $280 million in flood damage each year. Water storage: Dams create reservoirs that supply water for a multitude of uses, including fire control, irrigation, recreation, domestic and industrial water supply, and more. Irrigation: Ten percent of American cropland is irrigated using water stored behind dams. Navigation: U.S. Army Corps of Engineers navigation projects in the U.S. serve 41 states, maintain 12,000 miles of channels, carry 15% of U.S. freight carried by inland waterways, operate 275 locks, and maintain 926 harbors. Recreation: Dams provide prime recreational facilities throughout the U.S. 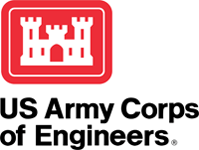 Ten percent of the U.S. population visits at least one U.S. Army Corps of Engineers facility each year. The purpose of a dam is to impound (store) water, wastewater or liquid borne materials for any of several reasons, such as flood control, human water supply, irrigation, livestock water supply, energy generation, containment of mine tailings, recreation, or pollution control. Many dams fulfill a combination of the above functions. Manmade dams may be classified according to the type of construction material used, the methods used in construction, the slope or cross-section of the dam, the way the dam resists the forces of the water pressure behind it, the means used for controlling seepage and, occasionally, according to the purpose of the dam. The materials used for construction of dams include earth, rock, tailings from mining or milling, concrete, masonry, steel, timber, miscellaneous materials (such as plastic or rubber) and any combination of these materials. 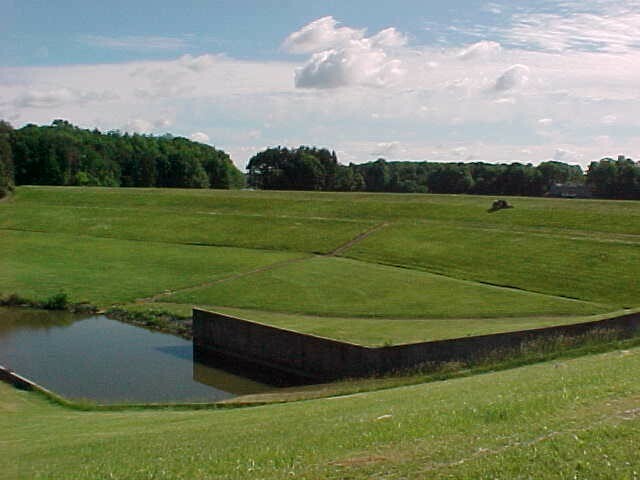 Embankment Dams: Embankment dams are the most common type of dam in use today. Materials used for embankment dams include natural soil or rock, or waste materials obtained from mining or milling operations. An embankment dam is termed an “earthfill” or “rockfill” dam depending on whether it is comprised of compacted earth or mostly compacted or dumped rock. The ability of an embankment dam to resist the reservoir water pressure is primarily a result of the mass weight, type and strength of the materials from which the dam is made. 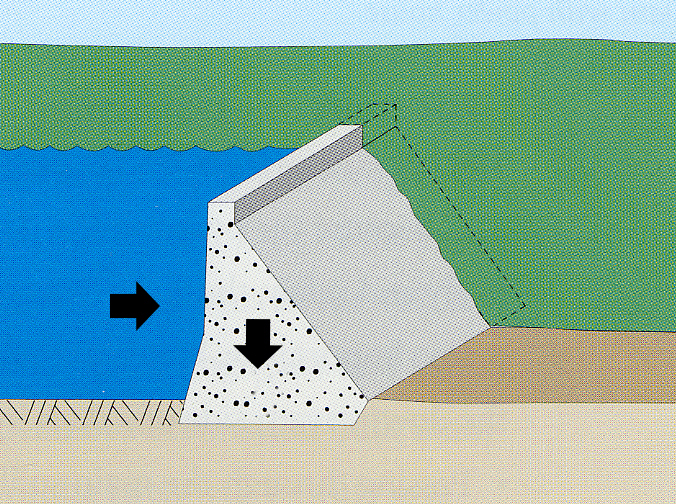 Concrete Dams: Concrete dams may be categorized according to the designs used to resist the stress due to reservoir water pressure. Three common types of concrete dams are: gravity, buttress and arch. Gravity: Concrete gravity dams are the most common form of concrete dam. The mass weight of concrete and friction resist the reservoir water pressure. Gravity dams are constructed of vertical blocks of concrete with flexible seals in the joints between the blocks. Buttress: A buttress dam is a specific type of gravity dam in which the large mass of concrete is reduced, and the forces are diverted to the dam foundation through vertical or sloping buttresses. 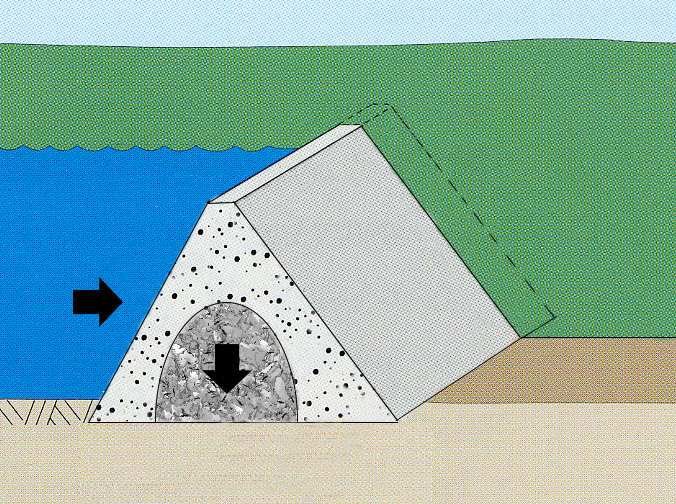 Arch: Concrete arch dams are typically rather thin in cross-section. The reservoir water forces acting on an arch dam are carried laterally into the abutments.The shape of the arch may resemble a segment of a circle or an ellipse, and the arch may be curved in the vertical plane as well. Such dams are usually constructed of a series of thin vertical blocks that are keyed together; barriers to stop water from flowing are provided between blocks. 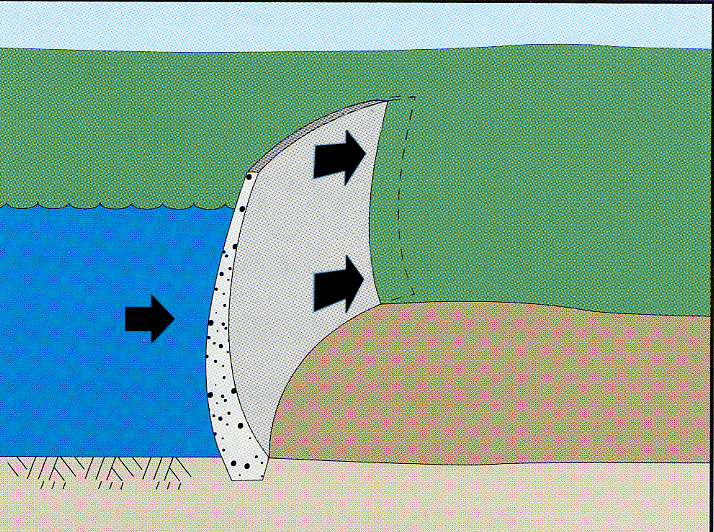 Variations of arch dams include multi-arch dams in which more than one curved section is used, and arch-gravity dams which combine some features of the two types of dams. Overtopping of an embankment dam is very undesirable because the embankment materials may be eroded away (See Video Example). 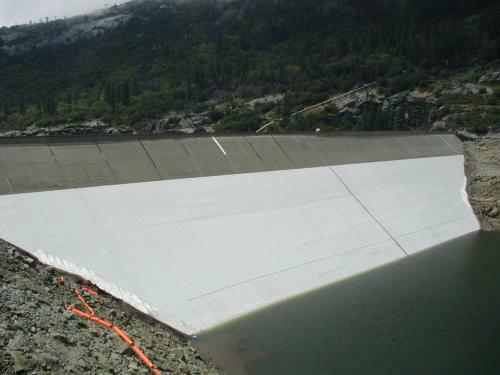 Additionally, only a small number of concrete dams have been designed to be overtopped. Water normally passes through the main spillway or outlet works; it should pass over an auxiliary spillway only during periods of high reservoir levels and high water inflow. All embankment and most concrete dams have some seepage. 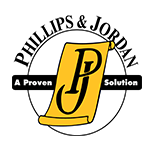 However, it is important to control the seepage to prevent internal erosion and instability. Proper dam construction, and maintenance and monitoring of seepage provide this control. Intentional release of water is confined to water releases through outlet works and spillways. A dam typically has a principal or mechanical spillway and a drawdown facility. Additionally, some dams are equipped with auxiliary spillways to manage extreme floods. 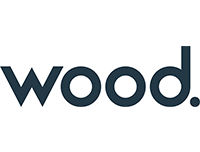 Outlet Works: In addition to spillways that ensure that the reservoir does not overtop the dam, outlet works may be provided so that water can be drawn continuously, or as needed, from the reservoir. They also provide a way to draw down the reservoir for repair or safety concerns. Water withdrawn may be discharged into the river below the dam, run through generators to provide hydroelectric power, or used for irrigation. Dam outlets usually consist of pipes, box culverts or tunnels with intake inverts near minimum reservoir level. Such outlets are provided with gates or valves to regulate the flow rate. 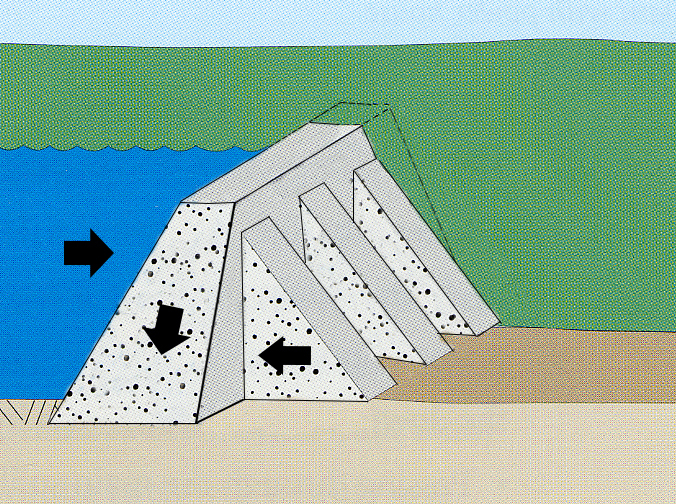 Spillways: The most common type of spillway is an ungated concrete chute. This chute may be located over the dam or through the abutment. To permit maximum use of storage volume, movable gates are sometimes installed above the crest to control discharge. Many smaller dams have a pipe and riser spillway, used to carry most flows, and a vegetated earth or rockcut spillway through an abutment to carry infrequent high flood flows. In dams such as those on the Mississippi River, flood discharges are of such magnitude that the spillway occupies the entire width of the dam and the overall structure appears as a succession of vertical piers supporting movable gates. High arch-type dams in rock canyons usually have downstream faces too steep for an overflow spillway. In Hoover Dam on the Colorado River, for example, a shaft spillway is used. In shaft spillways, a vertical shaft upstream from the dam drains water from the reservoir when the water level becomes high enough to enter the shaft or riser; the vertical shaft connects to a horizontal conduit through the dam or abutment into the river below. 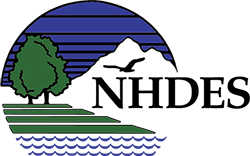 The National Inventory of Dams (NID) has catalogued the over 90,000 dams on America's waterways according to their hazard classification. Hazard classification is determined by the extent of damage a failure would cause downstream, with high-hazard potential dams resulting in loss of life and significant-hazard potential indicating a failure would not necessarily cause a loss of life, but could result in significant economic losses. As you can see on this map from the NID, there are numerous dams across America and ensuring their safety is a critical goal. Safety is key to the effectiveness of a dam. Dam failures can be devastating for the dam owners, to the dam’s intended purpose and, especially, for downstream populations and property. Property damage can range in the thousands to billions of dollars. No price can be put on the lives that have been lost and could be lost in the future due to dam failure. Failures know no state boundaries—inundation from a dam failure could affect several states and large populations. Early in this century, as many dams failed due to lack of proper engineering and maintenance, it was recognized that some form of regulation was needed. One of the earliest state programs was enacted in California in the 1920s. Federal agencies, such as the Corps of Engineers and the Department of Interior, Bureau of Reclamation built many dams during the early part of the twentieth century and established safety standards during this time. Slowly, other states began regulatory programs. But it was not until the string of significant dam failures in the 1970s that awareness was raised to a new level among the states and the federal government. There are several federal government agencies involved with dam safety. Together, these federal agencies are responsible for five percent of the dams in the U.S. 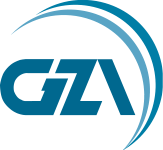 They construct, own and operate, regulate or provide technical assistance and research for dams. 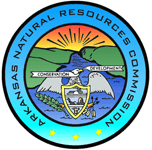 Included in this list are the Departments of Agriculture, Defense, Energy, Interior, Labor and State (International Boundary and Water Commission), the Federal Energy Regulatory Commission, Nuclear Regulatory Commission and the Tennessee Valley Authority. The Federal Emergency Management Agency administers the National Dam Safety Program, a program established by law in 1996 to coordinate the federal effort through the Interagency Committee on Dam Safety, to assist state dam safety programs through financial grants, and to provide research funding and coordination of technology transfer. Federal agency representatives make up about 16% of the ASDSO membership. 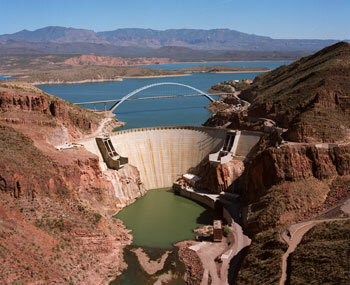 About 14% of dams in the USA are owned or regulated by federal agencies. The Federal Emergency Management Agency (FEMA), part of the Department of Homeland Security, does not own or regulate dams itself but administers the National Dam Safety Program, which coordinates all federal dam safety programs and assists states in improving their dam safety regulatory programs. The Office of Infrastructure Protection, also within the Department of Homeland Security, leads a coordinated national program to reduce risks to the nation's critical infrastructure, including dams, posed by acts of terrorism. 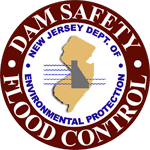 Together the agencies listed above make up the Interagency Committee on Dam Safety (ICODS), overseen by FEMA as head of the National Dam Safety Program. 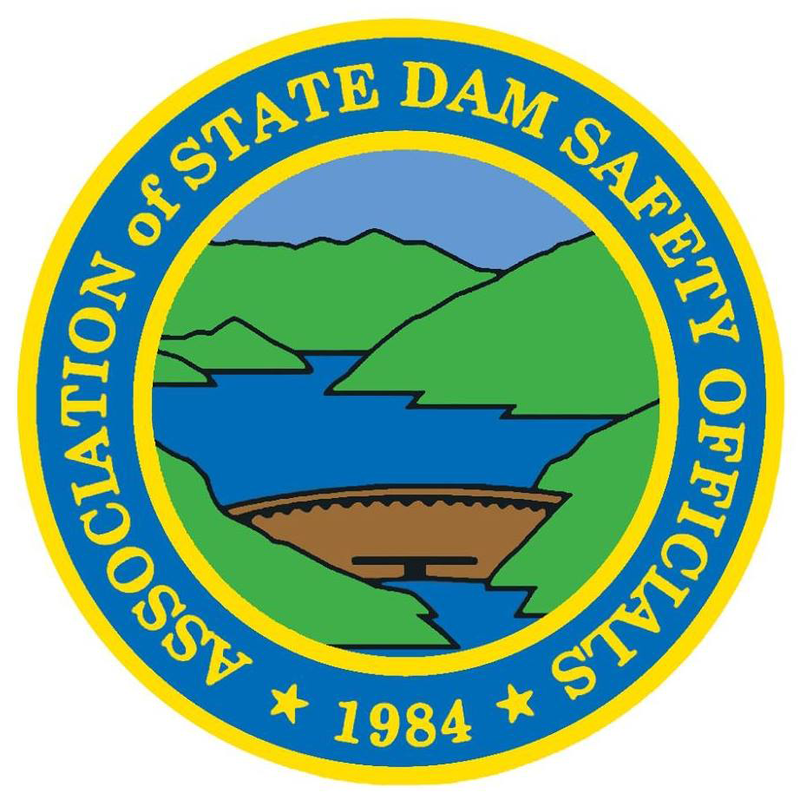 Other federal agencies that stay involved with ASDSO and the dam safety community are the National Oceanic and Atmospheric Association (NOAA), National Weather Service and the U.S. Geological Survey.